Delicata squash, also sometimes known as sweet potato squash or Bohemian squash, features yellow skin with green stripes on an oblong shape. This winter squash variety differs from other types due to its soft texture -- unlike winter squash, such as butternut and spaghetti squash, the delicata squash is easily chopped and sliced and does not require roasting or baking to soften its flesh. The Cook's Thesaurus notes that it has a taste similar to that of sweet potatoes. A 3/4-cup portion of delicata squash contains 30 calories, making it an excellent choice if your meal plan is developed for the purpose of losing weight. Plan your meal to pair a serving of delicata squash with both a lean protein, such as turkey breast or fish, and either a vegetable -- broccoli, carrots or green beans are a good choice -- or a healthy grain for a balanced, nutritious meal. 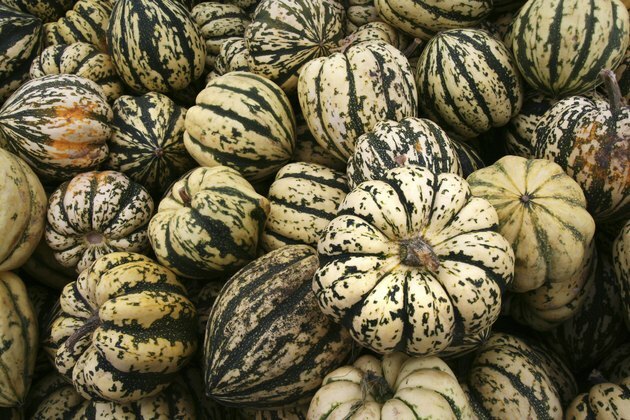 Delicata squash contains zero g of fat. Your body requires fat to function, although you need no more than 44 to 78 g of fat per day, or 20 to 35 percent of your daily calories. Delicata squash also fits into many low-carbohydrate eating plans -- a 3/4 cup serving had just 7 g of this macronutrient. If you follow a typical diet, however, your body requires approximately 130 g of carbohydrates to supply your body with energy. This squash can be stuffed, so if you have a concern about getting enough carbohydrates in your diet, consider serving squash with a hearty bread stuffing. A portion of plain delicata squash provides 1 g of fiber, a type of carbohydrate that does not break down into your body as fuel. This nutrient plays a critical role in preventing constipation and a colon condition known as diverticulitis. Incorporating delicata squash into your meal plan meets nearly 3/4 of your daily requirement of vitamin A per serving. This vitamin benefits your eyesight, especially your night vision. In addition, it contributes to the formation of your mucous membranes, teeth, skin and tissues. Delicata squash also serves as a good source of vitamin C -- each 3/4-cup serving contains 15 percent of the amount your body requires each day. This vitamin plays a vital role in wound healing, and you need to consume adequate amounts to properly use dietary iron. One serving of delicata squash provides 2 percent of the daily recommended intake of both iron and calcium. The iron in your diet contributes toward forming proteins that deliver oxygen throughout your body, including your muscles and bloodstream. The growth of your cells also depend on iron to help direct the process. The calcium in your meal plan promotes strong teeth and bones, and consuming enough is particularly critical as you get older, especially if you are a woman as your body needs more as you age. Be sure to supplement your meal plan to include foods richer in both iron and calcium than delicata squash to take in the amount you need each day. If you suffer from gluten intolerance, consider cutting delicata squash into noodle shapes or ribbons. When raw, these squash noodles make a tasty and gluten-free replacement for regular pasta made of wheat. You can top them with tomato sauce, as well as a variety of other sauces and toppings. The skin of this squash is edible after roasting or baking, which saves you time in the kitchen. It also boosts your nutrient intake -- the skin of vegetables often contains fiber and other vitamins and minerals.